I: MAJOR SKILLS IN PHYSICS PRACTICAL WORK I 1.1 INTRODUCTION The higher secondary stage is the most crucial and challenging stage of school education because at this stage the general undifferentiated curriculum changes into a discipline-based, content area-oriented course. At this stage, students take up physics as a discipline, with the aim of pursuing their future careers either in basic sciences or in science-based professional courses like engineering, medicine, information technology etc. Physics deals with the study of matter and energy associated with the inanimate as well as the animate world. Although all branches of science require experimentation, controlled laboratory experiments are of central importance in physics. The basic purpose of laboratory experiments in physics, in general, is to verify and validate the concepts, principles and hypotheses related to the physical phenomena. Only doing this does not help the learners become independent thinkers or investigate on their own. In view of this, laboratory work is very much required and encouraged in different ways.These may include not only doing experiments but investigate different facets involved in doing experiments. Many activities as well as project work will therefore ensure that the learners are able to construct and reconstruct their ideas on the basis of first hand experiences through investigation in the laboratory. Besides, learners will be able to integrateexperimental work with theory which they are studying at higher secondary stagethrough their environment. The history of science reveals that many significant discoveries have been made while carrying out experiments. In the growth of physics, experimental work is as important as the theoretical understanding of a phenomenon. Performing experiments by one’s own hands in a laboratory is important as it generates a feeling of direct involvement in the process of generating knowledge. Carrying out experiments in a laboratory personally and analysis of the data obtained also help in inculcating scientific temper, logical thinking, rational outlook, sense of self-confidence, ability to take initiative, objectivity, cooperative attitude, patience, self-reliance, perseverance, etc. Carrying out experiments also develop manipulative, observational and reporting skills. The ‘National Curriculum Framework’ (NCF-2005) and the Syllabus for Secondary and Higher Secondary stages (NCERT, 2006) have therefore, laid considerable emphasis on laboratory work as an integral part of the teaching-learning process. NCERT has already published Physics Textbook for Classes XII, based on the new syllabus. 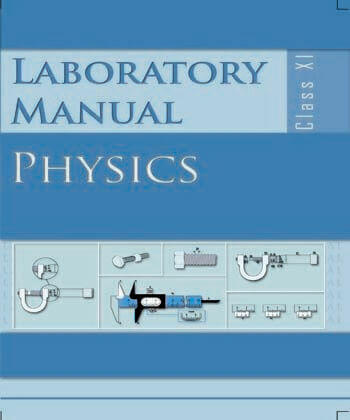 In order to supplement the conceptual understanding and to integrate the laboratory work in physics and contents of the physics course, this laboratory manual has been developed. The basic purpose of a laboratory manual in physics is to motivate the students towards practical work by involving them in “process-oriented performance” learning (as opposed to ‘product-or result-oriented performance’) and to infuse life into the sagging practical work in schools. In view of the alarming situation with regard to the conduct of laboratory work in schools, it is hoped that this laboratory manual will prove to be of considerable help and value. I 1.2 OBJECTIVES OF PRACTICAL WORK Physics deals with the understanding of natural phenomena and applying this understanding to use the phenomena for development of technology and for the betterment of society. Physics practical work involves ‘learning by doing’. It clarifies concepts and lays the seed for enquiry. Careful and stepwise observation of sequences during an experiment or activity facilitate personal investigation as well as small group or team learning. A practical physics course should enable students to do experiments on the fundamental laws and principles, and gain experience of using a variety of measuring instruments. Practical work enhances basic learning skills. Main skills developed by practical work in physics are discussed below. I 1.2.1 MANIPULATIVE SKILLS The learner developsmanipulative skills in practical work if she/he is able to (i) comprehend the theory and objectives of the experiment, (ii) conceive the procedure to perform the experiment, (iii) set-up the apparatus in proper order, (iv) check the suitability of the equipment, apparatus, tool regarding their working and functioning, (v) know the limitations of measuring device and find its least count, error etc., (vi) handle the apparatus carefully and cautiously to avoid any damage to the instrument as well as any personal harm, (vii) perform the experiment systematically. (viii) make precise observations, (ix) make proper substitution of data in formula, keeping proper units (SI) in mind, (x) calculate the result accurately and express the same with appropriate significant figures, justified by the degree of accuracy of the instrument, (xi) interpret the results, verify principles and draw conclusions; and (xii) improvise simple apparatus for further investigations by selecting appropriate equipment, apparatus, tools, materials. I 1.2.2 OBSERVATIONAL SKILLS The learner develops observational skills in practical work if she/he is able to (i) read about instruments and measure physical quantities, keeping least count in mind, (ii) follow the correct sequence while making observations, (iii) take observations carefully in a systematic manner; and (iv) minimise some errors in measurement by repeating every observation independently a number of times. I 1.2.3 DRAWING SKILLS The learner develops drawing skills for recording observed data if she/he is able to (i) make schematic diagram of the apparatus, (ii) draw ray diagrams, circuit diagrams correctly and label them, (iii) depict the direction of force, tension, current, ray of light etc, by suitable lines and arrows; and (iv) plot the graphs correctly and neatly by choosing appropriate scale and using appropriate scale. I 1.2.4 REPORTING SKILLS The learner develops reporting skills for presentation of observation data in practical work if she/he is able to (i) make a proper presentation of aim, apparatus, formula used, principle, observation table, calculations and result for the experiment, (ii) support the presentation with labelled diagram using appropriate symbols for components, (iii) record observations systematically and with appropriate units in a tabular form wherever desirable, (iv) follow sign conventions while recording measurements in experiments on ray optics, (v) present the calculations/results for a given experiment alongwith proper significant figures, using appropriate symbols, units, degree of accuracy, (vi) calculate error in the result, (vii) state limitations of the apparatus/devices, (viii) summarise the findings to reject or accept a hypothesis, (ix) interpret recorded data, observations or graphs to draw conclusion; and (x) explorethe scope of further investigation in the work performed. However, the most valued skills perhaps are those that pertain to the realm of creativity and investigation. I 1.3 SPECIFIC OBJECTIVES OF LABORATORY WORK Specific objectives of laboratory may be classified as process-oriented performance skills and product-oriented performance skills. I 1.3.1 PROCESS - ORIENTED PERFORMANCE SKILLS The learner develops process-oriented performance skills in practical work if she/he is able to (i) select appropriate tools, instruments, materials, apparatus and chemicals and handle them appropriately, (ii) check for the working of apparatus beforehand, (iii) detect and rectify instrumental errors and their limitations, (iv) state the principle/formula used in the experiment, (v) prepare a systematic plan for taking observations, (vi) draw neat and labelled diagram of given apparatus/ray diagram/circuit diagram wherever needed, (vii) set up apparatus for performing the experiment, (viii) handle the instruments, chemicals and materials carefully, (ix) identify the factors that will influence the observations and take appropriate measures to minimise their effects, (x) perform experiment within stipulated time with reasonable speed, accuracy and precision, (xi) represent the collected data graphically and neatly by choosing appropriate scale and neatly, using proper scale, (xii) interpret recorded data, observations, calculation or graphs to draw conclusion, (xiii) report the principle involved, procedure and precautions followed in performing the experiment, (xiv) dismantle and reassemble the apparatus; and (xv) follow the standard guidelines of working in a laboratory. I 1.3.2 PRODUCT - ORIENTED PERFORMANCE SKILLS The learner develops product-oriented performance skills in practical work if she/he is able to (i) identify various parts of the apparatus and materials used in the experiment, (ii) set-up the apparatus according to the plan of the experiment, (iii) take observations and record data systematically so as to facilitate graphical or numerical analysis, (iv) present the observations systematically using graphs, calculations etc. and draw inferences from recorded observations, (v) analyse and interpret the recorded observations to finalise the results; and (vi) accept or reject a hypothesis based on the experimental findings. I 1.4 EXPERIMENTAL ERRORS The ultimate aim of every experiment is to measure directly or indirectly the value of some physical quantity. The very process of measurement brings in some uncertainties in the measured value. THERE IS NO MEASUREMENT WITHOUT ERRORS. As such the value of a physical quantity obtained from some experiments may be different from its standard or true value. Let ‘a’ be the experimentally observed value of some physical quantity, the ‘true’ value of which is ‘a’. The difference (a – a) = e is called the error in the measurement.00Since a0, the true value, is mostly not known and hence it is not possible to determine the error e in absolute terms. However, it is possible to estimate the likely magnitude of e. The estimated value of error is termed as experimental error. The error can be due to least count of the measuring instrument or a mathematical relation involving least count as well as the variable. The quality of an experiment is determined from the experimental uncertainty of the result. Smaller the magnitude of uncertainty, closer is the experimentally measured value to the true value. Accuracy is a measure of closeness of the measured value to the true value. On the other hand, if a physical quantity is measured repeatedly during the same experiment again and again, the values so obtained may be different from each other. This dispersion or spread of the experimental data is a measure of the precision of the experiment/instrument. A smaller spread in the experimental value means a more precise experiment. Thus, accuracy and precision are two different concepts. Accuracy is a measure of the nearness to truth, while precision is a measure of the dispersion in experimental data. It is quite possible that a high precision experimental data may be quite inaccurate (if there are large systematic errors present). A rough estimate of the maximum spread is related to the least count of the measuring instrument. Experimental errors may be categorised into two types: (a)systematic, and (b) random. Systematic errors may arise because of (i) faulty instruments (like zero error in vernier callipers), (ii)incorrect method of doing the experiment, and (iii) due to the individual who is conducting the experiment. Systematic errors are those errors for which corrections can be applied and in principle they can be removed. Some common systematic errors: (i) Zero error in micrometer screw and vernier callipers readings. (ii) The ‘backlash’ error. When the readings on a scale of microscope are taken by rotating the screw first in one direction and then in the reverse direction, the reading is less than the actual distance through which the screw is moved. To avoid this error all the readings must be taken while rotating the screw in the same direction. (iii) The ‘bench error’ or ‘index correction’. When distances measured on the scale of an optical bench do not correspond to the actual distances between the optical devices, addition or substraction of the difference is necessary to obtain correct values. (iv) If the relation is linear, and if the systematic error is constant, the straight-line graph will get shifted keeping the slope unchanged, but the intercept will include the systematic error. In order to find out if the result of some experiments contains systematic errors or not, the same quantity should be measured by a different method. If the values of the same physical quantity obtained by two different methods differ from each other by a large amount, then there is a possibility of systematic error. The experimental value, after corrections for systematic errors still contain errors. All such residual errors whose origin cannot be traced are called random errors. Random errors cannot be avoided and there is no way to find the exact value of random errors. However, their magnitude may be reduced by measuring the same physical quantity again and again by the same method and then taking the mean of the measured values (For details, see Physics Textbook for Class XI, Part I, Chapter 2; NCERT, 2006). While doing an experiment in the laboratory, we measure different quantities using different instruments having different values of their least counts. It is reasonable to assume that the maximum error in the measured value is not more than the least count of the instrument with which the measurement has been made. As such in the case of simple quantities measured directly by an instrument, the least count of the instrument is generally taken as the maximum error in the measured value. If a quantity having a true value A0 is measured as A with the instrument of least count a, then A=( A± a)0 = A0 (1 ± aA/0 ) = A(1± f)0 a where fais called the maximum fractional error of A. Similarly, for another measured quantity B, we have BB0 (1 ± fb)= Now some quantity, say Z, is calculated from the measured value of A and B, using the formula Z = A.B We now wish to calculate the expected total uncertainty (or the likely maximum error) in the calculated value of Z. We may write Z = A.B = A(1 ± f).B(1± f)0 a 0 b = A0 B(1± f± fb± ff )0 a ab � A0 B0 ⎣⎡1±( fa+ fb)⎦⎤ , [If fa and fb are very small quantities, their product ff can be neglected]abor ZZ ≈ 0 [1± fz] where the fractional error f in the value of Z may have the largestzvalue of f .a + fb On the other hand, if the quantity Y to be calculated is given as Y = A/B = A0(1± fa )/B0(1± fb ) ⎡ A0⎤ = (± f )( 1± f )–1; YY1 = 0ab ⎢ 0 ⎥B⎣ 0⎦ 2(± f )1± f + f )= Y1 (0a bb = Y1(± f )( 1± f )0ab ~ Y1⎡ ±( f + f )⎤0⎣ ab ⎦ or Y = Y0 (1± fy ) , with fy = fa + fb, where the maximum fractional uncertainty f in the calculated value of Y is again . Note thatfa + fbythe maximum fractional uncertainty is always additive. Taking a more general case, where a quantity P is calculated from several measured quantities x, y, z etc., using the formula P = xa yb zc , it may be shown that the maximum fractional error f in the calculated pvalue of P is given as f = a f + b f + c f p x y z It may be observed that the value of the overall fractional error f in pthe quantity P depends on the fractional errors f, f, fetc. of each xyz measured quantity, as well as on the power a, b, c etc., of these quantities which appear in the formula. As such, the quantity which has the highest power in the formula, should be measured with the least possible fractional error, so that the contribution of a f + b f +c fz to the overall fraction error f are of the same orderx y pof magnitude. Let us calculate the expected uncertainty (or experimental error) in a quantity that has been determined using a formula which involves several measured physical parameters. A quantityY, Young’s Modulus of elasticity is calculated using the formula MgL3 Y= 43bd δ where M is the mass, g is the acceleration due to gravity, L is the length of a metallic bar of rectangular cross-section, with breadth b, and thickness d, andδ is the depression (or sagging) from the horizontal in the bar when a mass M is suspended from the middle point of the bar, supported at its two ends (Fig. I 1.1). Now in an actual experiment, mass M may be taken as 1 kg. Normally the uncertainty in mass is not more than 1 g. It means that the least count of the ordinary balance used for measuring mass is 1 g. As such, the fractional error fM is 1g/1kg or fM = 1 × 10–3. Let us assume that the value of acceleration due to gravity g is 9.8m/ s2 and it does not contain any significant error. Hence there will be no fractional error in g, i.e., fg = 0. Further the length L of the bar is, say, 1 m and is measured by an ordinary metre scale of least count of 1 mm = 0.001 m. The fractional error fL in the length L is therefore, f = 0.001 m / 1m = 1 × 10–3.LNext the breadth b of the bar which is, say, 5 cm is measured by a vernier callipers of least count 0.01 cm. The fractional error fb is then, f= 0.01 cm / 5 cm = 0.002 = 2 × 10 –3.b Similarly, for the thickness d of the bar, a screw gauge of least count 0.001 cm is used. If, a bar of thickness, say, 0.2 cm is taken so that f= 0.001 cm / 0.2 cm = 0.005 = 5 × 10–3.d Finally, the depression δ which is measured by a spherometer of least count 0.001 cm, is about 5 mm, so that fδ = 0.001 cm / 0.5 cm = 0.002 = 2 × 10–3. Having calculated the fractional errors in each quantity, let us calculate the fractional error in Y as fY = (1) fM + (1)fg + (3) fL + (1) fb + (3) fd + (1) fδ = 1 × (1 × 10–3) + 1 × 0 + 3 × (1 × 10–3) + 1 × (2 × 10–3) + 3 × (5 × 10–3) + 1 × (2 × 10–3) = 1 × 10–3 + 3 × 10–3 + 2 × 10–3 + 15 × 10–3 + 2 × 10–3 or, f= 22 × 10–3 = 0.022.Y Hence the possible fractional error (or uncertainty) is f × 100 = 0.022 y × 100 = 2.2%. It may be noted that, for a good experiment, the contribution to the maximum fractional error f in the calculated value y of Y contributed by various terms, i.e., fM, 3fL, fb, 3fd, and fδ should be of the same order of magnitude. It should not happen that one of these quantities becomes so large that the value of f is determined byy that factor only. If this happens, then the measurement of other quantities will become insignificant. It is for this reason that the length L is measured by a metre scale which has a large least count (0.1 cm) while smaller quantities d and δ are measured by screw gauge and spherometer,respectively, which have smaller least count (0.001 cm). Also those quantities which have higher power in the formula, like d and L should be measured more carefully with an instrument of smaller least count. The end product of most of the experiments is the measured value of some physical quantity. This measured value is generally called the result of the experiment. In order to report the result, three main things are required. These are – the measured value, the expected uncertainty in the result (or experimental error) and the unit in which the quantity is expressed. Thus the measured value is Fig. 1.1: A mass M is suspended from the expressed alongwith the error and proper unit as themetallic bar supported at its two ends value ± error (units). Suppose a result is quoted as A ± a (unit). This implies that the value of A is estimated to an accuracy of 1 part in A/a, both A and a being numbers. It is a general practice to include all digits in these numbers that are reliably known plus the first digit that is uncertain. Thus, all reliable digits plus the first uncertain digit together are called SIGNIFICANT FIGURES. The significant figures of the measured value should match with that of the errors. In the present example assuming Young Modulus of elasticity, Y = 18.2 × 1010 N/ m2; (please check this value by calculating Y from the given data) and Δ Y = ferror, yY ΔY = f .Y y = 0.022 × 18.2 × 1010 N/m2 = 0.39 × 1010 N/m2, where ΔY is experimental error. So the quoted value of Y should be (18.2 ± 0.4) × 1010 N/m2. I 1.5 LOGARITHMS The logarithm of a number to a given base is the index of the power to which the base must be raised to equal that number. If ax = N then x is called logarithm ofN to the base a, and is denoted by logaN [read as log N to the base a]. For example, 24 = 16. The log of 16 to the base 2 is equal to 4 or, log2 16 = 4. In general, for a number we use logarithm to the base 10. Here log 10 = 1, log 100 = log 102 and so on. Logarithm to base 10 is usually written as log. (i) COMMON LOGARITHM Logarithm of a number consists of two parts: (i) Characteristic — It is the integral part [whole of natural number] (ii) Mantissa — It is the fractional part, generally expressed in decimal form (mantissa is always positive). (ii) HOW TO FIND THE CHARACTERISTIC OF A NUMBER? The characteristic depends on the magnitude of the number and is determined by the position of the decimal point. For a number greater than 1, the characteristic is positive and is less than the number of digits to the left of the decimal point. For a number smaller than one (i.e., decimal fraction), the characteristic is negative and one more than the number of zeros between the decimal point and the first digit. For example, characteristic of the number 430700 is 5; 4307 is 3; 43.07 is 1; 4.307 is 0; 0.4307 is –1; 0.04307 is –2; 0.0004307 is –4 0.00004307 is –5. The negative characteristic is usually written as 1,2,4,5 etc and read as bar 1, bar 2, etc. I 1.5.1 HOW TO FIND THE MANTISSA OF A NUMBER? The value of mantissa depends on the digits and their order and is independent of the position of the decimal point. As long as the digits and their order is the same, the mantissa is the same, whatever be the position of the decimal point. The logarithm Tables 1 and 2, on pages 266–269, give the mantissa only. They are usually meant for numbers containing four digits, and if a number consists of more than four figures, it is rounded off to four figures after determining the characteristic. To find mantissa, the tables are used in the following manner : (i) The first two significant figures of the number are found at the extreme left vertical column of the table wherein the number lying between 10 and 99 are given. The mantissa of the figures which are less than 10 can be determined by multiplying the figures by 10. (ii) Along the horizontal line in the topmost column the figures 0 1 2 3 4 5 6 7 8 9 are given. These correspond to the third significant figure of the given number. (iii) Further right column under the figures (digits) corresponds to the fourth significant figures. 1 2 3 4 5 6 7 8 9 Example 1 : Find the logarithm of 278.6. Answer : The number has 3 figures to the left of the decimal point. Hence, its characteristic is 2. To find the mantissa, ignore the decimal point and look for 27 in the first vertical column. For 8, look in the central topmost column. Proceed from 27 along a horizontal line towards the right and from 8 vertically downwards. The two lines meet at a point where the number 4440 is written. This is the mantissa of 278. Proceed further along the horizontal line and look vertically below the figure 6 in difference column. You will find the figure 9. Therefore, the mantissa of 2786 is 4440 + 9 = 4449. Hence, the logarithm of 278.6 is 2.4449 ( or log 278.6 = 2.4449). Example 2 : Find the logarithm of 278600. Answer : The characteristic of this number is 5 and the mantissa is the same as in Example 1, above. We can find the mantissa of only four significant figures. Hence, we neglect the last 2 zero. ∴ log 278600 = 5.4449 Example 3 : Find the logarithm of 0.00278633. Answer : The characteristic of this number is 3, as there are two zeros following the decimal point. We can find the mantissa of only four significant figures. Hence, we neglect the last 2 figures (33) and find the mantissa of 2786 which is 4449. ∴ log 0.00278633 = 3.4449 When the last figure of a number consisting of more than 4 significant figures is equal to or more than 5, the figure next to the left of it is raised by one and so on till we have only four significant figures and if the last figure is less than 5, it is neglected as in the above example. If we have the number 2786.58, the last figure is 8. Therefore, we shall raise the next in left figure to 6 and since 6 is greater than 5, we shall raise the next figure 6 to 7 and find the logarithm of 2787. I 1.5.2 ANTILOGARITHMS The number whose logarithm isx is called antilogarithm and is denoted by antilog x. Thus, since log 2 = 0.3010, then antilog 0.3010 = 2. Example 1 : Find the number whose logarithm is 1.8088. Answer : For this purpose, we use antilogarithms table which is used for fractional part. (i) In Example 1, fractional part is 0.8088. The first two figures from the left are 0.80, the third figure is 8 and the fourth figure is also 8. (ii) In the table of the antilogarithms, first look in the vertical column for 0.80. In this horizontal row under the column headed by 8, we find the number 6427 at the intersection. It means the number for mantissa 0.808 is 6427. (iii) In continuation of this horizontal row and under the mean difference column on the right under 8, we find the number 12 at the intersection. Adding 12 to 6427 we get 6439. Now 6439 is the figure of which .8088 is the mantissa. (iv) The characteristic is 1. This is one more than the number of digits in the integral part of the required number. Hence, the number of digits in the integral part of the required number = 1 + 1 =2. The required number is 64.39 i.e., antilog 1.8088 = 64.39. Example 2 : Find the antilog of 2.8088. Answer : As the characteristic is 2, there should be one zero on the right of decimal in the number, hence antilog 2.8088 = 0.06439. Properties of logarithms: (i) logmn = logm + logn (ii) logam/n = logam – logan a aa (iii) logmn = n logm aa The definition of logarithm: loga 1 = 0 [since a0 = 1] The log of 1 to any base is zero, and logaa = 1 [since the logarithm of the base to itself is 1, a1 = a] I 1.6 NATURAL SINE / COSINE TABLE To find the sine or cosine of some angles we need to refer to Tables of trignometric functions. Natural sine and cosine tables are given in the DATA SECTION (Tables 3 and 4, Pages 270–273). Angles are given usually in degrees and minutes, for example : 35°6′ or 35.1°. I 1.6.1 READING OF NATURAL SINE TABLE Suppose we wish to know the value of sin 35°10′.You may proceed as follows: (i) Open the Table of natural sines. (ii) Look in the first column and locate 35°. Scan horizontally, move from value 0.5736 rightward and stop under the column where 6′ is marked. You will stop at 0.5750. (iii) But it is required to find for 10′. The difference between 10′ and 6′ is 4′. So we look into the column of mean difference under 4′ and the corresponding value is 10. Add 10 to the last digits of 0.5750 and we get 0.5760. Thus, sin (35°10′) is 0.5760. I 1.6.2 READING OF NATURAL COSINE TABLE Natural cosine tables areread in the same manner. However, because of the fact that value of cos θ decrease as θ increases, the mean difference is to be subtracted. For example, cos 25° = 0.9063. Toread the value of cosine angle 25°40′, i.e., cos 25°40′, we read for cos25°36′ = 0.9018. Mean difference for 4′ is 5 which is to be subtracted from the last digits of 0.9018 to get 0.9013. Thus, cos 25°40′ = 0.9013. I 1.6.3 READING OF NATURAL TANGENTS TABLE Natural Tangents table are read the same way as the natural sine table. I 1.7 PLOTTING OF GRAPHS A graph pictorially represents the relation between two variable quantities. It also helps us to visualise experimental data at a glance and shows the relation between the two quantities. If two physical quantities a and b are such that a change made by us in a results in a change in b, then a is called independent variable and b is called dependent variable. For example, when you change the length of the pendulum, its time period changes. Here length is independent variable while time period is dependent variable. A graph not only shows the relation between two variable quantities in pictorial form, it also enables verification of certain laws (such as Boyle’s law) to find the mean value from a large number of observations, to extrapolate/interpolate the value of certain quantities beyond the limit of observation of the experiment, to calibrate or graduate a given instrument for measurement and to find the maximum and minimum values of the dependent variable. Graphs are usually plotted on a graph paper sheet ruled in millimetre/centimetre squares. For plotting a graph, the following steps are observed: (i) Identify the independent variable and dependent variable. Represent the independent variable along the x-axis and the dependent variable along the y-axis. (ii) Determine the range of each of the variables and count the number of big squares available to represent each, along the respective axis. (iii) Choice of scale is critical for plotting of a graph. Ideally, the smallest division on the graph paper should be equal to the least count of measurement or the accuracy to which the particular parameter is known. Many times, for clarity of the graph, a suitable fraction of the least count is taken as equal to the smallest division on the graph paper. (iv) Choice of origin is another point which has to be done judiciously. Generally, taking (0,0) as the origin serves the purpose. But such a choice is to be adopted generally when the relation between variables begins from zero or it is desired to find the zero position of one of the variables, if its actual determination is not possible. However, in all other cases the origin need not correspond to zero value of the variable. It is, however, convenient to represent a round number nearest to but less than the smallest value of the corresponding variable. On each axis mark only the values of the variable in round numbers. (v) The scale markings on x-and y-axis should not be crowded. Write the numbers at every fifth cm of the axis. Write also the units of the quantity plotted. Use scientific representations of the numbers, i.e., write the number with decimal point following the first digit and multiply the number by appropriate power of ten. The scale conversion may also be written at the right or left corner at the top of the graph paper. (vi) Write a suitable caption below the plotted graph mentioning the names or symbols of the physical quantities involved. Also indicate the scales taken along both the axes on the graph paper. (vii) When the graph is expected to be a straight line, generally 6 to 7 readings are enough. Time should not be wasted in taking a very large number of observations. The observations must be covering all available range evenly. (viii) If the graph is a curve, first explore the range by covering the entire range of the independent variable in 6 to 7 steps. Then try to guess where there will be sharp changes in the curvature of the curve. Take more readings in those regions. For example, when there is either a maximum or minimum, more readings are needed to locate the exact point of extremum, as in the determination of angle of minimum deviation (δm) you may need to take more observations near about δm. (ix) Representation of “data” points also has a meaning. The size of the spread of plotted point must be in accordance with the accuracy of the data. Let us take an example in which the plotted point is represented as � , a point with a circle around it. The central dot is the value of measured data. The radius of circle of ‘x’ or ‘y’ side gives the size of uncertainty. If the circle radius is large, it will mean as if uncertainty in data is more. Further such a representation tells that accuracy along x- and y-axis are the same. Some other representations used which give the same meaning as above are , , , , ×, etc. In case, uncertainty along the x-axis and y-axis are different, some of the notations used are (accuracy along x-axis is more than that on y-axis); (accuracy along x-axis is less than that on y-axis). , , , , are some of such other symbols. You can design many more on your own. (x) After all the data points are plotted, it is customary to fit a smooth curve judiciously by hand so that the maximum number of points lie on or near it and the rest are evenly distributed on either side of it. Now a days computers are also used for plotting graphs of a given data. I 1.7.1 SLOPE OF A STRAIGHT LINE The slope m of a straight line graph AB is defined as Δym = Δx where Δy is the change in the value of the quantity plotted on the y-axis, corresponding to the change Δx in the value of the quantity plotted on the x-axis. It may be noted that the sign of m will be positive when both Δx and Δy are of the same sign, as shown in Fig. I 1.2. On the other hand, if Δy is of opposite sign (i.e., y decreases when x increases) than that of Δx, the value of the slope will be negative. This is indicated in Fig. I 1.3. Further, the slope of a given straight line has the same value, for all points on the line. It is because the value of y changes by the same amount for a given change in the value of x, at every point of the straight line, as shown in Fig. I 1.4. Thus, for a given straight line, the slope is fixed. While calculating the slope, always choose the x-segment of sufficient length and see that it represents a round number of the variable. The corresponding interval of the variable on y-segment is then measured and the slope is calculated. Generally, the slope should not have more than two significant digits. The values of the slope and the intercepts, if there are any, should be written on the graph paper. Do not show slope as tanθ. Only when scales along both the axes are identical slope is equal to tanθ. Also keep in mind that slope of a graph has physical significance, not geometrical. Often straight-line graphs expected to pass through the origin are found to give some intercepts. Hence, whenever a linear relationship is expected, the slope should be used in the formula instead of the mean of the ratios of the two quantities. I 1.7.2 SLOPE OF A CURVE AT A GIVEN POINT ON IT As has been indicated, the slope of a straight line has the same value at each point. However, it is not true for a curve. As shown in Fig. I 1.5,the slope of the curve CD may have different values of slope at points A′, A, A′′, etc. Fig. I 1.5: Tangent at a point A Therefore, in case of a non-straight line curve, we talk of the slope at a particular point. The slope of the curve at a particular point, say point A in Fig. I 1.5, is the value of the slope of the line EF which is the tangent to the curve at point A. As such, in order to find the slope of a curve at a given point, one must draw a tangent to the curve at the desired point. In order to draw the tangent to a given curve at a given point, one may use a plane mirror strip attached to a wooden block, so that it stands perpendicular to the paper on which the curve is to be drawn. This is illustrated in Fig. I 1.6 (a) and Fig. I 1.6 (b). The plane mirror strip MM′ is placed at the desired point A such that the image D′A of the part DA of the curve appears in the mirror strip as continuation of (a),	(b) DA. In general, the image D′ A will not appear to be smoothly joined with the part of the curve DA as shown in Fig. I 1.6 (a). Next rotate the mirror strip MM′, keeping its position at point A fixed. The image D′Α in the mirror will also rotate. Now adjust the position of MM′ such that DAD′ appears as a continuous, smooth curve as shown in Fig. I 1.6 (b). Draw the line MAM′ along the edge of the mirror for this setting. Next using a protractor, draw a perpendicular GH to the line MAM′ at point A. GAH is the line, which is the required tangent to the curve DAC at point A. The slope of the tangent GAH (i.e., Δy /Δx) is the slope of the curve CAD at point A. The above procedure may be followed for finding the slope of any curve at any given point. I 1.8 GENERAL INSTRUCTIONS FOR PERFORMING EXPERIMENTS 1. The students should thoroughly understand the principle of the experiment. The objective of the experiment and procedure to be followed should be clear before actually performing the experiment. 2. The apparatus should be arranged in proper order. To avoid any damage, all apparatus should be handled carefully and cautiously. Any accidental damage or breakage of the apparatus should be immediately brought to the notice of the concerned teacher. 3. Precautions meant for each experiment should be observed strictly while performing it. 4. Repeat every observation, a number of times, even if measured value is found to be the same. The student must bear in mind the proper plan for recording the observations. Recording in tabular form is essential in most of the experiments. 5. Calculations should be neatly shown (using log tables wherever desired). The degree of accuracy of the measurement of each quantity should always be kept in mind, so that final result does not reflect any fictitious accuracy. The result obtained should be suitably rounded off. 6. Wherever possible, the observations should be represented with the help of a graph. 7. Always mention the result in proper SI unit, if any, along with experimental error. I1.9 GENERAL INSTRUCTIONS FOR RECORDING EXPERIMENTS A neat and systematic recording of the experiment in the practical file is very important for proper communication of the outcome of the experimental investigations. The following heads may usually be followed for preparing the report: DATE:--------EXPERIMENT NO:---------- PAGE NO.------AIM State clearly and precisely the objective(s) of the experiment to be performed. APPARATUS AND MATERIAL REQUIRED Mention the apparatus and material used for performing the experiment. DESCRIPTION OF APPARATUS INCLUDING MEASURING DEVICES (OPTIONAL) Describe the apparatus and various measuring devices used in the experiment. TERMS AND DEFINITIONS OR CONCEPTS (OPTIONAL) Various important terms and definitions or concepts used in the experiment are stated clearly. PRINCIPLE / THEORY Mention the principle underlying the experiment. Also, write the formula used, explaining clearly the symbols involved (derivation not required). Draw a circuit diagram neatly for experiments/activities related to electricity and ray diagrams for light. PROCEDURE (WITH IN-BUILT PRECAUTIONS) Mention various steps followed with in-built precautions actually observed in setting the apparatus and taking measurements in a sequential manner. OBSERVATIONS Record the observations in tabular form as far as possible, neatly and without any overwriting. Mention clearly, on the top of the observation table, the least counts and the range of each measuring instrument used. However, if the result of the experiment depends upon certain conditions like temperature, pressure etc., then mention the values of these factors. CALCULATIONS AND PLOTTING GRAPH Substitute the observed values of various quantities in the formula and do the computations systematically and neatly with the help of logarithm tables. Calculate experimental error. Wherever possible, use the graphical method for obtaining the result. RESULT State the conclusions drawn from the experimental observations. [Express the result of the physical quality in proper significant figures of numerical value along with appropriate SI units and probable error]. Also mention the physical conditions like temperature, pressure etc., if the result happens to depend upon them. PRECAUTIONS Mention the precautions actually observed during the course of the experiment/activity. SOURCES OF ERROR Mention the possible sources of error that are beyond the control of the individual while performing the experiment and are liable to affect the result. DISCUSSION The special reasons for the set up etc., of the experiment are to be mentioned under this heading. Also mention any special inferences which you can draw from your observations or special difficulties faced during the experimentation. These may also include points for making the experiment more accurate for observing precautions and, in general, for critically relating theory to the experiment for better understanding of the basic principle involved.